It’s morning. 9 PM. I’m sitting in the car. Feeling very nervous. I didn’t know why but supposed that nowadays I have a lot of money from my PTPTN, but then now, we didn’t have anything. All of our educational loan money are spent in books. A clinical book, pathological book and 2 more pharmacology and histopathology cost me around RM600. It’s totally super expensive and we don’t have choices. We have to take it or leave it. The PTPTN only give us RM1000. RM600 for books, RM200 for a new MP4 player, only RM200 for our daily expenditure. RM 200? My car petrol cost me more than that for a month. It’s not enough. Really not enough. And we have to buy that ant this for example have to buy t-shirt for the sports day and we force to buy our college magazine even though that magazine don’t bring any benefits to us. That is why I’m here. We are here. Waiting outside.. outside the real place where people kept their money. And we plan this for a long-long time. 4 of us, everyone with their own specialties. I’m not sure whether this plan will work. Just pray. And pray a lot. We didn’t mean to do this. It’s all their fault. And we always blame others for our mistake. Everyone in their post now. I’m still in the car, thinking about something. About what I do until I’m running out of money. Well, at first, RM1000 is so much for me. And I feel like I can buy the whole world with it. Haha. But study is our first consideration, so no matter what, we must consider our study first. Thus, I order all of the text book that I’m going to use for this whole semester from this so called SMS book shop. Then I decided to buy a new MP4 player (consider to be my first musical gadget.) Before this I used to use discman, but it’s damn broke. Haha. So for the months I’m listening music just through my laptop and it’s impossible to me to listen to music while I’m in the class or when I’m in the bus or walking from school to the bus stop or etc… So I really want to buy this MP4 player. And it’s 2 days after the book I order arrive, a PC fair was held in KK. I know that they will sell a lot of MP4 there. And it will cost a lot cheaper than usual. And I’m true. RM185 for a MP4 player with 1GB memory and an external BL-4C battery( the battery u use for NOKIA handphone. It’s very cheap for me. So I bought one, and I also bought a headphone with super bass that cost me RM25. Plus I ate McD that cause me also around RM20++ ( what the heck). I’m very happy now. I got my MP4 player, with a super boom boom headphone. Haha, I can study with a lot better environment now. You know what, I have a problem when studying in a crowd of people for example in my class. With so many people producing different frequency of noise, I’m very distracted. I don’t know why I’m too sensitive to sound frequency. Even a small frequency of sound will distract me. So, I buy a MP4 so I can listen to music when I’m studying in my class. By using this method, I can concentrate more ( what a stupid fact – music also a type of sound!!!). it’s my style of study. Ok then. The petrol for driving from my University to KK cost me RM20. What? See, I almost spend all of my money. And I also have to buy food later. I know this wouldn’t be enough. I heard that PTPTN will bank in the balance of our money as soon as possible. But when? Until we all starving to death Until my car couldn’t move anymore? So when I calculate and calculate again, my money wouldn’t be enough until the next month. And I can’t wait anymore. So I came up with this plan. An easy plan that we used to do. Haha. Sitting in the car I look at my watch. Just a few second. A few second later we will take action and we will make sure that it is clean as possible. Camera lock. Camera disable for 10 minutes. The first sign, I’m smiling waiting for another progress from my collegue. Gas released, everything free for the next 7 minutes. Yes. That’s what I want to hear. Everything is free. Thus I walk out from the car and walk like nothing could possibly happen in this critical 7 minutes. A few Chinese girl and a few malay girl are wandering around the main door. What a stupid interference. But why should I care. I wouldn’t endanger their life. I wouldn’t hurt them. Why are they here? Supposed that we clean everything first. few mites in front.. why are they here? Don’t say that we have to retreat now! Even I look relax and cool but I’m sending a angry message to my collegue somewhere around that area with the GPS system. And I got no reply. Damn. The dump lorry will arrive any moment. I have to solve this fast. Very fast. “Is this place closed?” that damn Chinese girl is asking me. What I’m supposed to say? I didn’t ask for your name girl. And I’m not the manager. What I’m supposed to do now. Where is my colleague? Maybe I should just ignore this bunch of chicks but they already saw my face. They are witnesses. But we must handle everything professionally. No blood to be spilled, no voice should be heard, and no footprint should be left. “Please take your seat ladies. Table no.46. My apologized cause I can’t direct you all fine ladies to the table cause I only have 7 minutes here.” What the heck? Stupid word come out from my mouth. But all the girls just look confused and smiled. Thus they are more stupid than me. Haha. 7 minutes? They all are stupid enough and I hope that they don’t remember what I just say. And they walk, to the table 46. And I take my place back. Walking directly to the door of our glory. I opened it and directly grabbing all the cash and put it in the garbage bag. And throw it in the big dustbin outside. And then I left. And the effect of the gas we released will soon be gone in a few minutes. I walk straight to my car, get in and drive it a few metres from that area and then my colleague is waiting there changing the plat number and the color of the car instantly. That is his specialty. Meanwhile, the gas effect is gone. The staff there are wondering why they are lying on the floor sleeping while they are all on work. Overloaded with curiosity, they check their own college and check whether anything is missing. The camera is on. The check for the money. And it’s still there. We are not stupid to grab them all. We left a lot of money there, just a few percent of the money that we ‘take’. We hoped that they didn’t realize the small lost of the money. But they are not that stupid. Still they can see that the money is reducing. And in that time I know that the garbage truck already there. Packing up their garbage. And know one will dare to check all the garbage cause know one will throw money in there. Later we drive the car straight to the city, and the cops is very fast. A road block are already set up. And our car was check, but nothing wrong with it. Cause we fix all the wrong thing earlier. We pass the block. And we are all laughing and singing in the car. Park the car nearby town, waiting for the owner to come. And when the owner come, the car is totally different. But it seems that it is more solid than before and the owner just take it after a few questions. Now we walk to our real car that we park earlier there. And drive it straight to the dumping area? Is there any possibility that we lost that one garbage truck? No. Because one of my friend is already waiting there at the dumping site. Now for the dirty work. Searching for the black garbage bag full of RM50 cash inside. To be continued…… or maybe. Picture taken after we found that black garbage back. 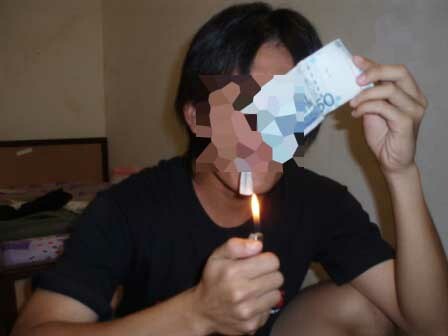 Guess i can smoke now.. With this 5o ringgit bill. I'm totally rich man. Haha. This guy really satisfied on his job. Too much party. Now i'm the one who clean it. This is not fair. Astalavista. I can buy anything with this. This is what we called, suxsesful job. We name it, The garbage job!